The demand for quick-service Mexican food has increased in recent years. So, companies like Chipotle, Qdoba, and Taco Bell supply. 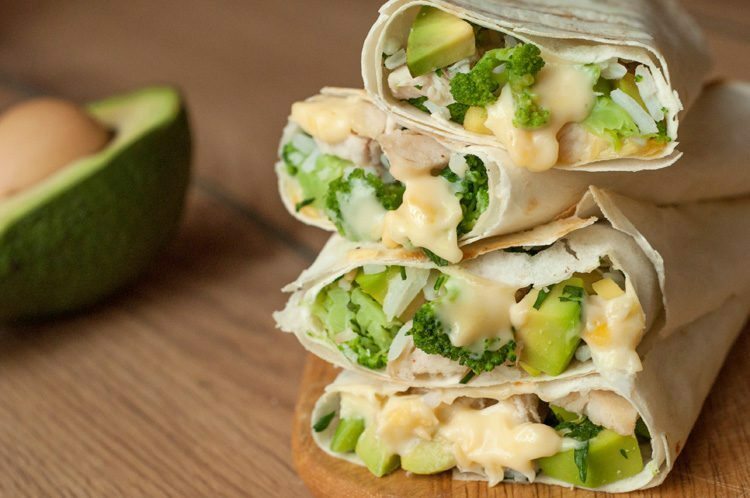 Gathering inspiration from their offerings, we created these Healthy Chicken Burrito Wraps as an alternative. Whole wheat wraps, brown rice, and low fat cheese cut back on calories, and broccoli bulks up the nutrients. Avocado adds a healthy fat, while chicken breast rounds it out with lean protein. Best of all, you can make most of the ingredients yourself! In a mixing bowl mix together chicken, rice, avocado, broccoli, cilantro and cheddar cheese. Evenly distribute the mixture in the middle of the tortillas and fold them over tight, making sure the filling doesn’t fall out . Heat a grill pan or a skillet, add extra-virgin olive oil. Set the filled wraps on a pan and cook over medium-high heat for about 2-3 minutes on each side until tortillas are golden brown and cheese is melted inside. 0 Response to "Healthy Chicken Burrito Wraps"